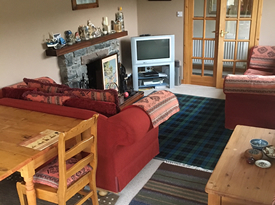 Your hosts Christine & John Smyth offer a warm welcome to Beinn Edra bed and breakfast, our home overlooking Loch Duich encircled by mountains & forests. To make a booking, please phone 01599 511291 or e-mail beinnedra@gmail.com. An awesome panorama for all seasons. 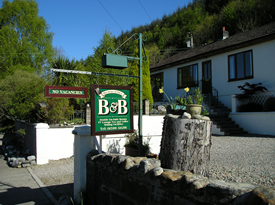 Beinn Edra bed and breakfast is on the main road A87 in upper Inverinate. Our house is near but on the opposite side of the road from the local petrol station: travelling towards Eilean Donan Castle & the Isle of Skye. Enjoy a full breakfast to set you up for the day, which is included in the price. We have ensuite 3 bedrooms and a self contained family room, with a residents lounge available for you to relax in. 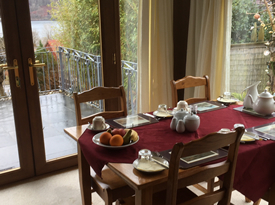 Enjoy your full cooked breakfast overlooking Loch Duich and the spectacular mountain scenery of Glenshiel.